Welcome to my first proper post since my return from my hols. Today I am sporting nubbins. Before we went away I got my nails chopped and shaped and I can't believe how much they've grown in 2 weeks, 1 of the benefits of living in a warm climate I suppose. Anyway I'm embracing my nubbins by sporting more autumnal colours. 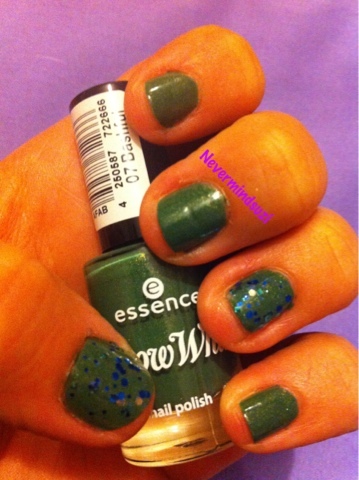 When I was out and about yesterday I FINALLY managed to nab some of the Essence Snow White collection, they didn't have much so I took all I could and Bashful, a lovely olive green with a golden shimmer was 1 of the few they had left. I also wanted to try the lovely prize polish out that I win from Polish Monsters recent giveaway so added Girly Bits Wet Bikini to my ring and thumb. So are you still rocking summery brights or have you made the transition of seasons yet?